Our team has the expertise needed to safely and effectively clean any roof and make it look as good as new. We use only the safest and most effective roof cleaning methods in the industry. We offer our 5 star rated roof cleaning services to our neighbors and friends here in Columbia Maryland. Call us today or fill out the free no obligation estimate form and let us show you why we are rated #1 Rated in Maryland. Here at Columbia Brothers Power Washing we are committed to providing consistently reliable service in a timely and professional manner. Our roof cleaners are professionally trained, highly skilled and courteous. What sets us apart as being the top rated roof cleaning company, is we actually enjoy what we do, and are dedicated to serving our customers. Give us a call or fill out a contact form to set up your free estimate! If your roof looks bad due to ugly stains and black streaks caused by Algae, it doesn’t necessarily mean your roof needs to be replaced. Roof cleaning may be all that is needed. It is estimated that half of all roofs are needlessly replaced due to appearance rather than structural integrity. Although, if your roof is left uncared for and algae is left on the shingles, then the longevity of the shingle and the roof as a whole will be shortened. Get the results your home deserves with our premier quality roof cleaning services. Our roof cleaning techniques focus on the removal of algae and mildew. Our goal is to return your roof back to it’s original color thereby restoring your homes curb appeal as well as extending the life of your roof. Our low pressure roof washing process is the exact process recommended by national roof manufacturers for properly cleaning asphalt shingled roofs. To match your clean roof, contact us for a free window cleaning estimate. Routine Roof Maintenance is extremely important. 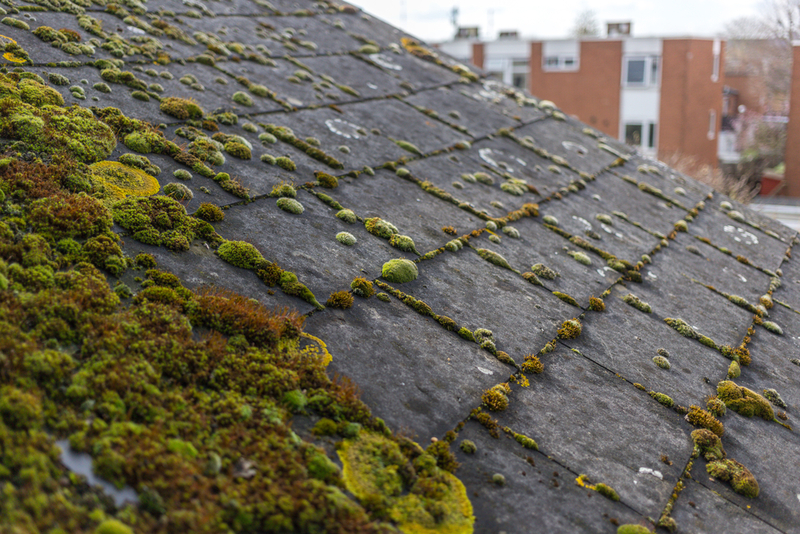 Mold, Algae, and Mildew will eventually return to a roof, some sooner than others. Just as before, it will start very small and unnoticed. The more ground it covers, the faster it will begin to spread. The recommended prevention is a quicker, maintenance cleaning every 1-3 years. This can vary from home to home depending on shade, humidity, and moisture levels through the year. Give us a call so we can get started on cleaning your roof and restoring it to its original beauty. Our team of expert roof cleaners will customize a roof cleaning schedule at an affordable price! We are always here to offer our professional services to you and set your mind at ease. Our dedicated staff invests the time and energy necessary to be well prepared for any unique requests or special concerns our clients may have. If you are looking to add instant curb appeal to your home, give us a call, our expert roof cleaners can help! Professional Roof Cleaning is something that requires skill, knowledge, and the right equipment. Columbia Brothers Power Washing has been cleaning roofs of our neighbors here in Columbia for years. Our team of certified experts are prepared and fully equipped with the correct tools and best techniques in the industry. We use only low pressure or non pressure roof cleaning methods, and the right cleaners and detergents as recommended by roofing product manufacturers. This ensures your roof is cleaned safely and properly. Each member of our team will be happy to answer any questions and explain the roof cleaning techniques used and how it will benefit you and your roof and save you money. This is a 5 star company! It was very easy to schedule an estimate, confirm appointment, and see our roof go from old to new again! You guys do amazing work. Great, thorough work and kind staff! Would definitely recommend to others! Hard workers, amazing services, and affordable prices! I will definitely be using your company for regular roof cleaning. Great experience. House looks like it has a new roof! All touch points with personnel were excellent - professional, courteous, and friendly. We had Columbia Brothers help us with our roof cleaning this summer and they did an excellent job! They were very thorough and polite! I will be using them again in the future! I use these guys to help me with my full exterior house cleaning! They make my home sparkle every time. I always recommend their services to my friends and family!! 5 stars!! Best roof cleaners in Columbia Maryland!! !